Navigate to contacts, companies, deals, or tasks. To edit a few individual records, select the checkboxes next to the records you want to edit. To edit all of the contacts on a page, select the Select all checkbox at the top of the table. Then, to select all of the contacts in the filter, click the Select all [number] contacts link. At the top of the table, click Edit. Click the Property to update dropdown menu and select the property you want to edit. In the field that appears, set a new value for the selected property. You can also make a bulk update to a list of contacts or companies by doing an import and mapping the updated property values. Learn more about updating existing records with an import. 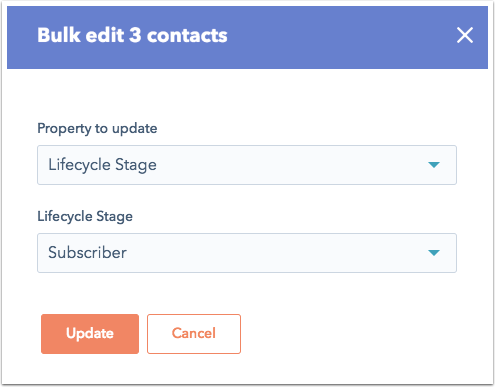 Please note: if you're a Marketing Hub Professional or Enterprise; Sales Hub Professional; or Service Hub Professional user, you can set a contact property value for multiple contacts using workflows.